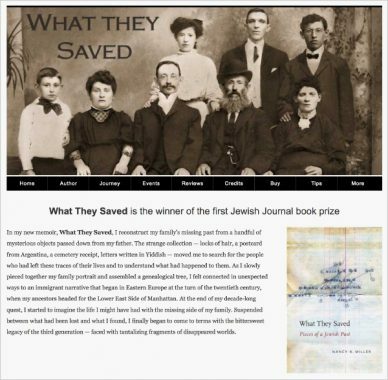 This project is the companion website for my book What They Saved. In addition to background information about my odyssey, I have documented my journey to Eastern Europe. The site is also the repository of interviews I did for the book once it as published, as well as images from the archive of objects and photographs saved by my father that I was not able to include in the book. Some of the objects and documents that were crucial to my discoveries could not be reproduced in the book for reasons of space and quality of the image, but I like having them on the website so that the book can continue to grow, beyond publication, as it were, in the form of a scrapbook—to which others join their memories, and contribute to a conversation of what it means to recreate these past lives. Please visit the What They Saved website to see the entire project and find out more information about the book on here. View an October 2014 lecture My Memoirs Make Me Jewish: Family, Memory and the Writing Self I gave at the University of Illinois.